Funeral services for Mrs. Sherry Ann Ward Shanks of Solomon Drive Ellenwood, Georgia will be held on Saturday July 21, 2012 at Global Impact Christian Ministries in Stockbridge, Georgia. Burial will follow on Sunday, July 22, 2012 at Cedar Hill Cemetery in Dawson Georgia. A wake will be held Thursday July 19, 2012 from 6 to 8 p.m. at Ward Funeral Home in Dawson, Georgia. Another wake will be held on Friday, July 20, 2012 from 6 to 8 p.m. at the Global Impact Christian Ministries in Stockbridge, Georgia. Sherry Ann Ward Shanks was born on September 26, 1955 in Dawson, GA to the late Louvenia Ward and Sammie Lee Ward. 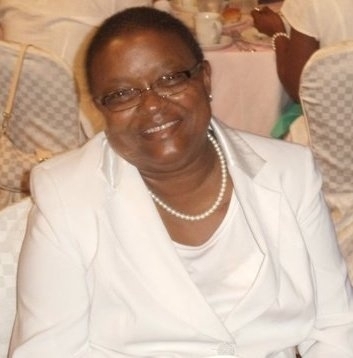 She died on Wednesday, July 11, 2012 at her home in Ellenwood, Georgia. She is survived by her husband Robert Shanks Jr.; one daughter Petronia Aeisha Shanks; two grandsons: Immanuel Shanks and Nehemiah Shanks; her father, Sammie Lee Ward; two brothers: James (Hattie) Ward, Forrest (Fetina) Ward; three sisters: Stephanie (Kenny) Ward White, Carolyn (Ben Lee) Williams and Helen Anderson; a host of other relatives and friends also survive. Funeral services for Mrs. Lottie Mae Brown of Montezuma, Georgia will be held on Sunday, July 8, 2012 at 1:30 p.m. at the New Hope Baptist Church with Rev. Allen Waters officiating. Burial will follow at the church cemetery. Mrs. Lottie Mae Brown was born October 21, 1929 in Montezuma, Georgia to the late Frank Robinson and the late Flora B. White Robinson. At an early age she accepted Jesus Christ as her personal savior and joined New Hope Baptist Church. She was united in holy matrimony to the late Mr. Clifford Brown, Sr. This union was blessed with eight children. On Wednesday, July 4, 2012, she departed this life at her home. Her brother Herbert Robinson and sister Virginia White preceded her in death. Her memory will forever be cherished by her children: Jimmy (Mattie) Brown, Willie James (Shirley) Brown, and Jerry Brown of Montezuma, Georgia, Clifford (Lucille) Brown, Willie Frank Brown, Sr., Terry (Sherry) Brown, J.S. Brown, and Jean Brown of Marshallville, Georgia; two grandchildren reared as her own: Tyeshia and Nishalic Brown; twenty-four grandchildren, forty-three great grandchildren, sixteen great great grandchildren; two sisters-in-law: Mary Lizzie Brown of Marshallville, Georgia and Bernice Brown of Miami, Florida; a host of nieces, nephews, other relatives and friends also survive. Funeral services for Mr. James Bell, Sr. of 1301 2nd Montgomery Street Americus, GA will be held on Friday, July 6, 2012 at 11:00 A.M. at the Mt. Olive Baptist Church with Rev. Dr. H.C. Wilson officiating. Burial will follow at Staley Memorial Gardens. Our loved one, Mr. James Bell, Sr., son of the late Mr. Oscar Bell and Mrs. Addie L. Bell was born on January 7, 1923 in Washington County, Georgia. He received his education in Washington County public schools. James was a loving son, brother, father, husband and friend. He accepted Christ as his personal Savior at an early age and joined Pine Hill Missionary Baptist Church in Davisboro, Georgia. He served wherever he was needed. He was a faithful member until he moved away. In October of 1952 he was united in Holy matrimony to the late Mrs. Bennie Lee Bell. They shared many beautiful years together. He loved to travel, and finally settled in Americus, Georgia, where he joined the Mt. Olive Baptist Church and remained a faithful member until his health failed and God called him home on Sunday, July 1, 2012. Mr. Bell was preceded in death by two brothers: Mr. McKinley Bell, Mr. Sherman Britt Bell, and a sister, Mrs. Fina Mae Bell Gardner. James leaves to cherish his loving, caring, thoughtful and devoted memories to his God-Daughter, Ms. Susie W. Henderson, Plains, Georgia; two sons: Mr. Willie Frank Bell, of California and Mr. James (Glover Dean) Bell, Jr. Americus, Georgia; three daughters: Mrs. Diane (James) Holman, Douglasville, Georgia, Ms. Debra Smith, Americus, Georgia and Ms. Melinda Price, Marietta, Georgia; three sisters: Mrs. Susie (Murphy) Zimmerman, Mrs. Alberta Juhan, both of Atlanta, Georgia and Mrs. Addie Lee (Robert) Lockhart, Clarksville, Tennessee; one brother, Mr. Arthur Lee (Dora) Bell of Atlanta, Georgia; a host of grandchildren, great grandchildren, nieces, nephews, cousins, several other relatives, sitters, nurses, and friends.